According to tradition, the milky-white veins on the leaves of milk thistle originated from the milk of the virgin Mary, which once fell upon a plant, hence its alternative names, St Mary’s thistle and Our Lady’s thistle. Milk thistle has been used medicinally since the times of the ancient Greeks and Romans and, in the 17th century, the British herbalist Nicholas Culpepper recommended its use to ‘provoke urine’, ease dropsy (swelling of soft tissues due to the accumulation of excess water), remove obstructions of the liver and cure jaundice. Today, more than 300 studies confirm milk thistle’s benefits in treating liver-related and other disorders. The seeds contain essential oils, unsaturated fatty acids and a flavonoid complex of three liver-protecting compounds collectively called silymarin. The main active ingredient is silybin, which fortifies and repairs damage to the liver and kidneys. Support liver function and metabolism. Reduce hepato-cellular necrosis and fatty deposits in the liver. Decrease SGOT in patients with chronic liver disease such as cirrhosis. Stimulate the gall bladder and assist bile flow, reducing the risk of gallstone formation. Increase levels of glutathione, an amino acid-like compound that is essential to help protect the liver against environmental toxins, including drugs, poisons, chemicals, heavy metals and alcohol. Help in cases of cholelithiasis, chronic hepatitis, fatty liver, varicosities and haemorrhoids. Increase milk flow in nursing mothers. Side effects may include nausea, upset stomach, heartburn, joint pain and headache. Do not take milk thistle if you are allergic to plants from the Asteraceae or Compositae family, such as sunflower, daisy or chamomile. May interact with medications broken down by the liver, such as oral contraceptives, medications to control blood sugar and warfarin. Consult your doctor before taking herbal remedies. Milk thistle leaves contain manganese, iron, phosphorus, zinc and selenium. The plant was once cultivated as a vegetable, when its young and tender leaves were stripped of their spiky marginal thorns and steamed like spinach. Serve with lemon juice and salt. Trimmed, the young leaves taste like a combination of spinach and romaine lettuce, and can be used in a salad. To make milk thistle tea, pour 1 cup of boiling water over ¼ cup of fresh, chopped leaves. Leave to steep for 5 minutes and strain. 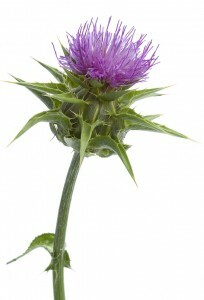 Milk thistle is a tough annual that originated in Europe, central Asia and parts of east Africa. Its prickly, white-marbled leaves reach 60–70 cm in length and the plant bears spires of magenta flowers. The black seeds that follow are the sole means of propagating the plant. Sow the seeds in spring, in trays, and prick out the tiny seedlings when they are big enough to handle. Plant them in richly composted soil in full sun. Once you have milk thistle in the garden it will re-seed every season. If untended, it can spread widely.